First published in 1993 as The Battle of Lundy's Lane. On the Niagara in 1814, this book was a selection of the Military Book Club that year. In 1997, a revised edition with the title Where Right and Glory Lead! appeared and is a study of the two most hard-fought battles of the War of 1812: Chippawa fought on 5 July 1814 and Lundy's Lane fought on 25 July 1814. In its 5th printing, Where Right and Glory Lead! has become a minor classic, one British historian describing it 'as the best book about a battle ever written." "Graves presents an unparalleled analysis of how this confusing and complicated night battle unfolded, and in the process deftly cuts through conflicting contemporary reports, especially on how the British regained their captured artillery at the end of the battle. 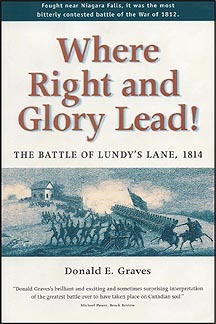 [Where Right and Glory Lead] like Field of Glory, shows that no one is better than Graves at penetrating the fog and friction of war, and both of these volumes are must reading for anyone who wants to understand the military history of the War of 1812." Donald Hickey, "The Top 25 Books of the War of 1812,"
"Lundy's Lane is one of those battles you know about, but really don't know about. ...... What author Graves has been able to do is sift through a mountain of primary written material" to "craft a highly readable and convincing account of events." "a vivid and scholarly account of ... a desperate and extraordinary night battle, written by a master of the military techniques of the day ... an enjoyable and compelling read." "The battle is told in great detail, and the key characters enter and depart from the scene in a fashion characteristic of great historical narrative. ...... it is a matter of celebration of find a superb history of one such battle ...... an excellent example of the 'sharp end' of military history." "Graves is also a master of detail. He has marshalled thousands of facts into one coherent picture, judiciously mixing an impressive knowledge of all things military with anecdote and even dialogue taken from the diaries, memoirs and official records of a surprising number of men who partook in the actual battle. The voices of the dead speak for themselves; their words give the book a welcome ring of authenticity and human intimacy. ...... read Donald Graves's brilliant and exciting and sometimes surprising interpretation of the greatest battle ever to have taken place on Canadian soil. His book is a rare and welcome achievement." "entertaining history that delves into what made both armies of that time tick. It is as much an account of soldiers in battle as the battle itself." "a most lucid description of weaponry, drill, equipment, and unit terminology ... augmented by clear, uncluttered maps. ...... It will be the chief source work on the battle for years to come. General readers, undergraduates, and above." "With the revisions that take into account recent scholarship, Where Right and Glory Lead! is now more than ever the definitive account of the Battle of Lundy's Lane." "There are many dreary, ill-produced histories of Canadian units. The pity is this one wasn't published 30 years ago to become a model other regimental associations would try to match. It has 'class' ...... Best of all there are graphic accounts of all the unit's major fights, from the beachhead in Normandy to the armistice in north-east Germany. ...... I am captivated by the vividness and integrity of the narrative. What develops in a way unmatched by other such book are short accounts wherever possible of each man who was killed or badly wounded, often with quotes from comrades of gritty to witty features in personality and deeds." "An excellent tactical study of a Napoleonic period battle." "an exercise in military history at its best." "comprehensive and compelling ...... Meticulously documented, cogently argued, this book alone will secure Graves's reputation among military historians." "Graves narrates a complete account of the battle in a highly readable style. ...... Graves's notes on the terminology of the period are neither pedantic nor pedestrian, the accompanying maps are perfectly placed and executed ... and his eyewitness accounts are intuitively chosen, each ringing true." "Through diligent research and an ability to look upon the events with a detachment rarely seen in an historian writing about the history of his own country, Graves has stripped away those layers of legend and has allowed us to see the battle as it really was for the first time. ...... the definitive work on the Battle of Lundy's Lane and all that have preceded must be measured against it. ...... a must read for history buffs and the casual reader alike." "evokes, even more than Keegan, the full texture of a battle and its relationship to the conflict of which it was a part. Graves's devotion to this particular event is evident in the extensive research, textured prose, and deft analysis that engages the reader."